A baked cheese cake topped with a mango mousse is sure to please your pallet with it's fresh flavor and creamy smooth texture. The coconut crust and fresh mango and kiwi on top add a tropical element. 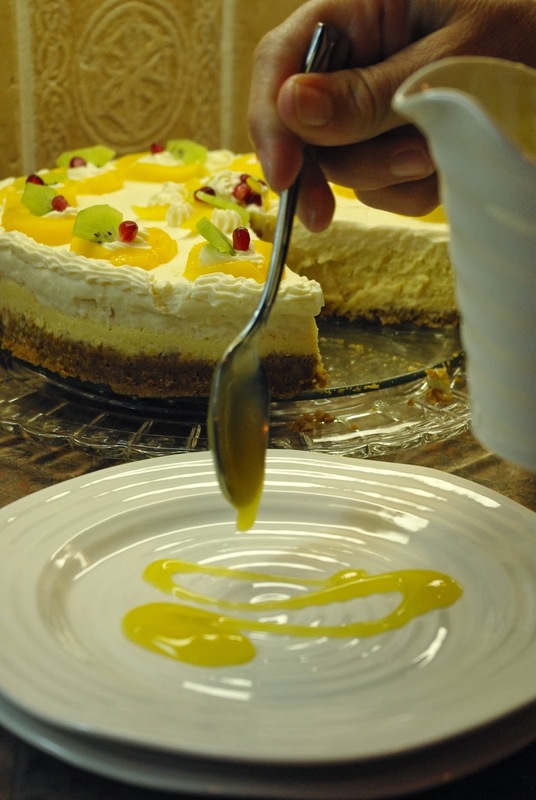 Serve slices of cheesecake over a puddle of mango sauce. To make crust, place crumbs, coconut and sugar in a 10"spring form pan. Pour melted butter over and mix with a fork pressing into bottom of pan to form a crust. Bake in 350º F oven for 7 minutes. Remove and set aside to cool. Reduce heat to 225º F.
To make filling, beat together cream cheese and sugar until fluffy. About 5 minutes. Add one egg at a time and only beat until each egg is incorporated. Do not over beat. Immediately add remaining filling ingredients, and beat just until incorporated. Pour filling over crust and bake in 325º F oven for 60 minutes. For the mousse, put 1/4 cup of the mango juice in a small sauce pan and sprinkle gelatin over. Let sit for 5 minutes and then cook over low heat until gelatin has dissolved. Remove from heat and stir in remaining juice. Chill to cool and set. Beat cream with vanilla and sugar. Fold into cooled mango mixture. Spoon mousse mixture over cooled baked cheesecake and smooth. Cover and place in refrigerator for up to 4 days. To make the Mango sauce, stir together juice, cornstarch and sugar. Heat in a small pot on top of stove or microwave bowl. Stir often until mixture bubbles and begins to thicken. Cover and refrigerate until cool. Puddle onto plates when ready to serve and top with a slice of cheesecake. I grew up in the tropics where mangoes grew on trees in abundance. If only I could sneak a piece of that cheesecake off the plate! I am hitting the print button on this! Wow - Kathy - this looks amazing. How many packages of cream cheese make up 1 1/2 lbs ? That just looks and sounds sinfully delicious... I must try it! Printing it out as I type. I was lucky enough to have that slice Kathy is plating and let me tell you.. it is delicious. I will be making this soon. I am soooo making that! I love mango cheesecake! Just made this recipe and found that the cake didn't set. Is the 225 degree oven temperature possibly incorrect? I'm so sorry to hear that it did not set. I've re checked the temperature and it is accurate at 225º. I've re looked at the recipe too and I'm not sure what may have happened. It's so disappointing when that happens. If I think of something else I'll come back with another reply. The only thing I wonder is that ovens can vary in temperature accuracy and sometimes also altitude can make a difference when baking....possibly you could have left it in a bit longer than I suggested...maybe another 10-15 minutes. Sponsors ~ Tracycakes & Wesley Ellen Kitchens. Saturday in Norma's Kitchen..making perogies.